Beamdog is back. If you aren’t excited as a D&D fan you should be. 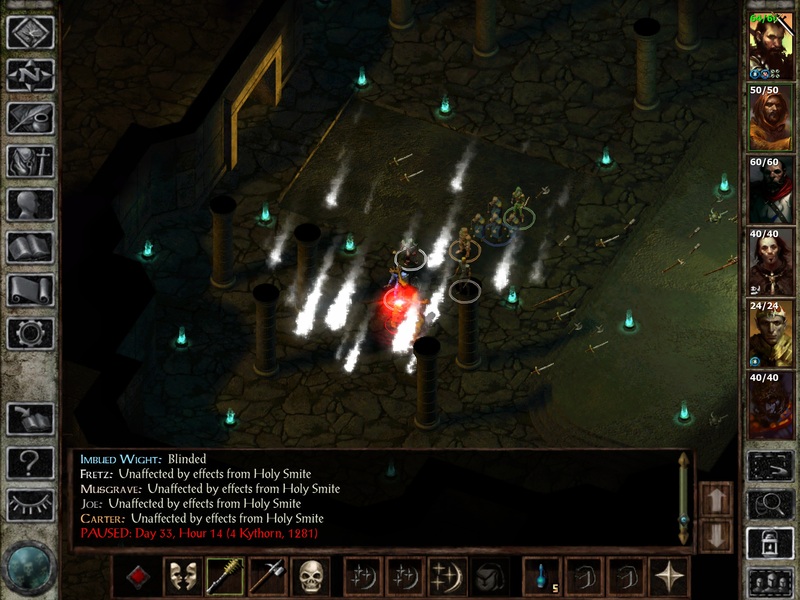 Not just a straight port, Icewind Dale: Enhanced Edition($9.99) is bringing some new toys to the table and I’ve been geeking out ever since I got my hands on them. Forty years ago a game was published that changed my life. I wasn’t alive at the time, but thats besides the point. In case you’ve been away for those last 40 years, let me introduce you to Dungeons & Dragons. D&D games, in general, are a fusion of story telling and dice determined events. These events range from social interactions to mechanical manipulations to melee combat and spell casting. The universe of D&D is that of swords and sorcery, taverns and hamlets, heroes and dice. Lots and lots of dice. So where does Icewind Dale fit in? As a follow up to the Baldur’s Gate duet, the original IWD I and II were both met with overwhelmingly positive critical acclaim. The only reason these games weren’t even more popular is that the first one hit market about the same time as the major blockbuster Diablo II. Boasting a robust and complicated combat system, IWD: EE now today holds a high standard of logical complexity that the RPG genre as a whole can still look up to. Probably one of the most time worn features of the game is the graphics. Functional is probably the only positive I can come up with. If you are looking for cutting edge graphics or eye popping metal display qualities… what are you doing here? You should know that the game is gonna look dated and I dont hold that against IWD: EE. I think the most important thing to state here and reiterate is that it IS functional and for me at least, the game looks like nostalgia. With the incorporation of bits and pieces of previously enhanced Baldur’s Gate($9.99) you will see some new things creeping in. One of my favorites is an expanded class roster. 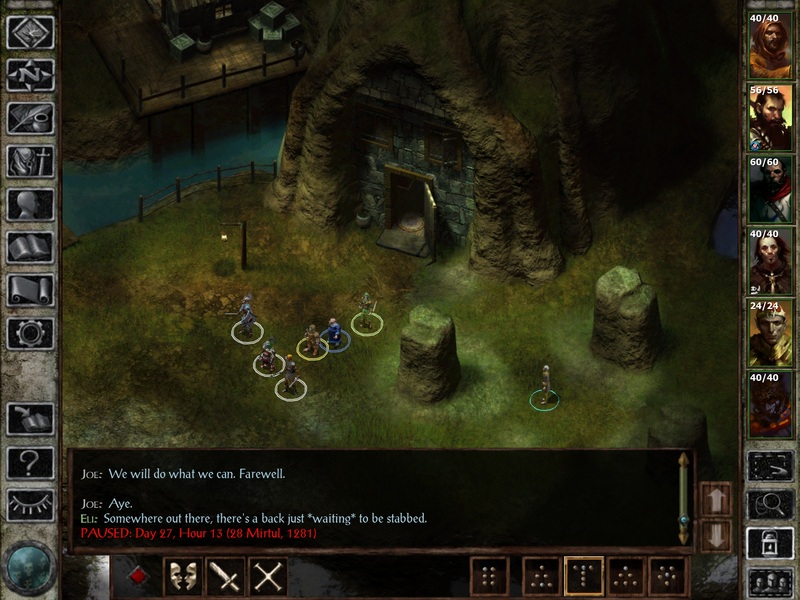 Already known for it’s extensive choices for multi-classing, this is a perfect area of expansion for Icewind. Any veteran player should really enjoy the ability to craft a specific team with specific goals in mind. My touch arcade themed crew has been doing pretty well. Bard Eli and Mage Jared sit back and chuckle as the writers are embroiled in melee and Thief Carter makes the most ridiculous jokes. Paladin Fretz kinda just slaps stuff half-heartedly while Kensai Musgrave cleaves the world in twain. The voice sets made available get a little repetitive. After a few hours listening to the same lines I usually end up changing who my lead character is just to hear some new stuff as I am walking around town or travelling. Icewind has a very slow pace. 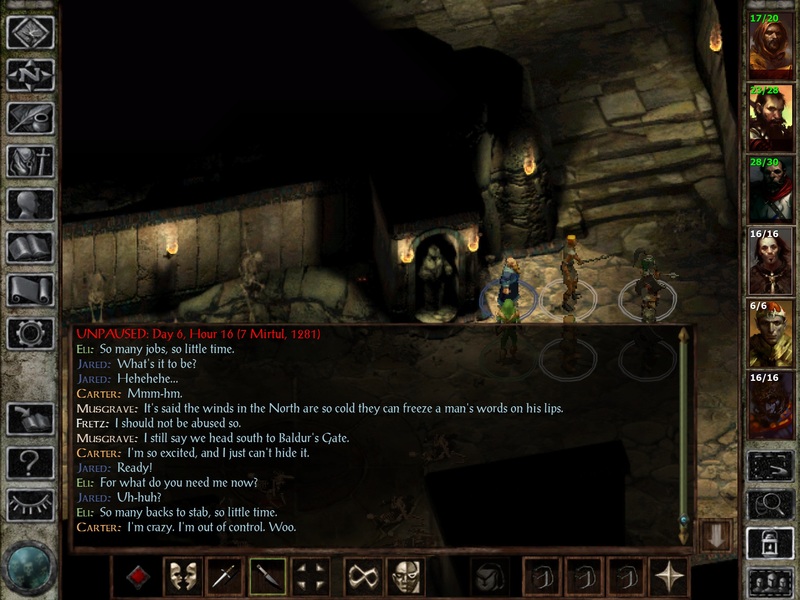 In most modern RPGs, you will manage a bunch of quests at a time and usually only spend a few minutes on each one. When you take on a quest in IWD, you should not expect to finish it in one sitting. Main storyline quests especially represent this. I think the last quest I picked up has taken somewhere in the neighborhood of 8 hours to complete from start to finish. Is this a bad thing? no. I really like the throw back to a quest being a feat that you aren’t neccessarily expected to complete easily. The quests feel like these monolithic lofty things that you can only glimpse small pieces of at a time. It’s an important part of crafting the experience to make you feel like maybe your party bit off more than it can chew. Combat is also a slow affair. You may have to rest between almost every fight in order to heal and recharge spells that are almost required for most serious fights. Resting has a decent chance of attracting enemies even if you do it in an enclosed area. Another bit about the game play is the difficulty. The game is really tough. My biggest recommendation is to enable auto-game pausing in the options. Without it you will probably be spending a large amount of time reloading after you lose party members. The broad scope of quests and the grave danger your heroes face combine to make for an epic feel. That’s not a feeling you will get with many contemporary games and it’s something that I miss. For players new to the genre, I would also suggest lowering the difficulty or hitting a wiki for help on building a competent group. I’ve touched briefly on nostalgia. I admit that it’s impossible for me to view this game without appreciating the signicance of it’s legacy. If I try to view this game without regard to the history behind it, I THINK I can still say its an amazing game. Couple that with the fantastic edit job with a bunch of new features and this is a fantastic app for anyone looking for a fantasy RPG adventure that works best in long unbroken stints.